Here is a wonderful Italian soup full of good groceries like pasta, olive oil, tomatoes and cheese. I hope you will give vermicelli soup a try. Heat butter and oil in skillet. Fry the broken raw vermicelli in the skillet until golden, stirring constantly. Add onion and garlic to skillet and fry until soft. 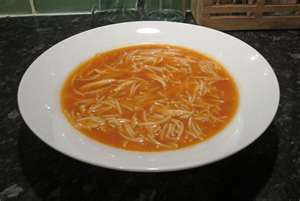 Add tomato puree, stock, parsley and reserved vermicelli. Cover, bring to boil and cook until vermicelli is tender. Prepare Pilou in a soup tureen or serving bowl. Gradually pour the soup over the pilou. Ladle out the soup and offer the cheese. In soup tureen place 3 egg yolks. Beat the yolks until golden. Simple to make, enjoy some vermicelli soup soon. this sounds amazing--i will try this next week! This is a very interesting recipe, Anthony...I have never heard of 'pilou' which, I'll assume, thickens the soup. I can't have the noodles, but I can substitute for something else. I love all things Italian and this soup sounds deliciously fresh-flavored! KAREN WALKER: Yeah, it is good. ACH DU LIEBER: Ach du lieber, that's great. Thank You. JARM DEL BOCCIO: I'm sorry that you cannot have noodles. perhaps rice might do here for you. JOANNE: This is one deliziosa zuppa Joanne, I hope you will enjoy it presto. Ciao. Hi Anthony! Sounds like an interesting soup. Hmmmmm kind of like spaghetti soup. I am going to show this to the Hubs and see if it is something he might like. Thanks Anthony! SUSANNE DRAZIC: Thanks, it is. COOKINGVARIETIES: Thanks for your kind words. Best wishes to you. LUBNA KARIM: Creamy and comforting sums it up well. MY JOURNEY WITH CANDIDA: What's not to like, cm. Hope you are well Terry, best wishes.